IT was ladies night in the Keadeen Hotel in Newbridge recently at the 15th annual Nollaig na mBan ball organised in memory of Gina Lavelle Walsh. Gina passed away from breast cancer at the age of 40 and each year her daughter and sisters rally together to help raise funds for St Brigids Hospice in her memory. 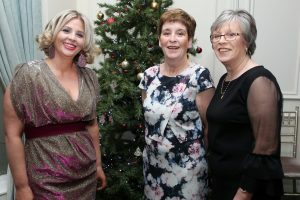 Over the years they have managed to raise close to €100,000 and the annual Nollaig na mBan night has become a huge tradition for the ladies in Newbridge. Nollan na mBan 2019 at the Keadeen hotel. Organising committee Gillian Scully, Marie Lavelle and Adrienne Donnelly. “It is only for the women that come every year that we can do this,” said Gina’s sister Marie Lavelle. Gina passed away when her daughter Gillian was just 12 years old and her son John was eight. Her sisters Marie Lavelle and Adrienne Donnelly started to fundraise in her memory and the night is now with the help of Gina’s daughter Gillian Scully.